When Queen Victoria died in January 1901 a reign, a century and an entire age were passing. Her son, Edward VII, would give his name to an era of unparalleled luxury and opulence. A new decorative style was emerging, Art Nouveau, with its flowing, organic forms, which were reflected in the sinuous curves of the Edwardian lady. The height of fashion still seemed to be that of the Lady - mature, sophisticated and well-bred. But increasingly, there was hope for the ordinary woman, hope that had been founded in the last decade of the previous century. In fact, even the flowing lines of Edwardian fashion were rooted in the final years of the Victorian age. Though we conveniently define these eras as Victorian and Edwardian, stylistically, the line between them is blurred. The 1890s merge seamlessly with the early 1900s in an age of extravagance and style, appropriately called la Belle Epoque and lasting from approximately 1890 to 1914. This world began to decline by 1914, but the Great War ended it forever. Until then, throughout the early 1900s, fashion enjoyed its last true age of elegance, in what has been described as one long Edwardian summer. The woman of 1901 presented a new, flowing silhouette unlike that of any of her Victorian predecessors. Her skirt curved outwards over her full behind, downwards and apparently slightly inwards towards knee-level and then sharply outwards again at the hem. This gave the appearance of a concave skirt. It often extended into a sweeping train, even during the day. Carried out in soft, flowing fabrics and with little drapery to interrupt the outline, it could reveal more of the figure than the slim but stiff and heavily draped skirts of the late 1870s for example. The bodice above was usually moulded on a tight, and well-boned foundation. The outer layer was cut a little fuller and longer in front than the lining and was arranged to droop over the waistband. The sleeves of 1901 were quite tight at the top but flared out from below the elbow, drooping over the tight cuff. The whole effect was curved, flowing and extremely feminine. The new silhouette required a new figure, shaped by a new style of corset. The straight-fronted corset had emerged in the very late 1890s and by 1900 was the accepted fashion. It tilted the figure, pushing the full bosom forward but the narrow shoulders and full posterior backwards. This peculiar curved stance was called the S bend and was sometimes counter-balanced by leaning elegantly on a long-handled parasol or fashionable cane. The new corset also provided the tiny waist beloved of Victorian and Edwardian women, something it had originally been designed to eradicate. Furthermore, it was cut low and did not divide the bust as nineteenth century corsets had done, giving the impression of a single, wide, low mono-bosom. Full curves and a low bosom were extremely fashionable and denoted the popularity of the mature, matronly woman at this time. Fashion historians attribute this to the middle-aged King and his appreciation of the mature woman. Fashion leaders of the early 1900s included Queen Alexandra, along with a number of society beauties and leading actresses including Lily Langtry, Alice Keppel, Camille Clifford, Sarah Bernhardt and Lillian Russel. Few of them could be called spring chickens. The mono-bosom and pouched bodice complemented each other stylistically. Neither seems balanced without the other. Bodices were sometimes adjusted on the inside by patent devices to keep them dipped in the front. Additional draped features, (such as bolero fronts and knotted fichus), were often incorporated into the design of the front of the bodice to further accentuate the bust. The bloused or pouched effect had begun in the late 1890s but was taken to an excess in the very early 1900s. In 1901 the blousing was concentrated in the very centre of the front, but by 1904 it spread round to the sides too. It began to diminish after 1905, leaving only enough extra fabric to accommodate the mono-bosom by 1910, without actually drooping over the waistband in front. The waistband and tiny waist were emphasised with belts and sashes of every kind, made on a boned foundation, dipping in front to a point and swathed with silk. Only princess dresses (with no waist seams) were made, by necessity, with no pouching. Day bodices of 1901 had a standing collar. These were slim and high and, unlike those of the 1890s, generally were not covered in the kind of pleated and ruched drapery that could make the neck look fat. They were often shaped to reach as high as possible at the back of the jaw-line, just behind the ear, then dipped slightly at the back, under the hairline and in front, under the chin. These unevenly shaped collars are characteristic of the Edwardian era, persisting throughout the first decade and only disappearing during the Great War. Edwardian high collars were stiffened with collar stays of wire or whalebone and usually not with the stiff interlinings of the 1890s. By the middle of the decade it was acceptable to have a moderately low neckline during the day, largely due to the painful inconvenience of the high, boned collar. Evening bodices began the decade with very low necklines and often little or no sleeves, but by 1905, the neckline rose a little and sleeves became fuller. Early Edwardian sleeves tended to be tight at the top of the arm and a little fuller at the wrist, where they were gathered into a tight cuff. This wrist fullness soon increased in width and drooped over the cuff. The sleeve head also began to acquire some gathers and the whole sleeve looked as concave as the skirt - full at the top, narrow in the middle and wide at the bottom. From about 1900 to 1905, open-ended or pagoda sleeves were also worn, with an engageante (a gathered sleeve end) or a blouse sleeve to finish the wrist, as in the mid-Victorian period. By 1905 there was a change of emphasis. The fullness at the wrist disappeared, the width at the top increased and there was a return to the leg-of-mutton, full puffed and double-puffed sleeves of the 1890s. As in 1890s they were occasionally referred to as 1830s style. These sleeves can cause some confusion in distinguishing between 1905 and 1895 bodices. The fullness remained at the top or in a puff to the elbow, until about 1909, when sleeves had become altogether tighter. By 1910 kimono or Magyar sleeves cut in one with the body had introduced a new note of simplicity. The skirt also underwent a gradual change during the early 1900s. It began in 1901 as clinging and S-shaped, often cut in gores that curved outwards below the knee and was sometimes called a mermaid skirt. The circular skirts that began in the early 1890s were also worn, tucked or darted at the top, often down to knee level and flaring out below. Other skirts combined a gored or slightly flared top half with a circular flounced lower half. Day skirts were sometimes trained, and the hems were highly decorated with ruffles of fabric and lace. By 1904, the concave curve was still apparent, but the skirt began to be fuller at the waist and therefore less clinging. The curved cut was diminishing after 1905 until it began to resemble the angular gores of mid 1890s skirts. Unlike the ’90s, however, they were not worn over stiffened, triangular petticoats, so they still sat in soft folds that seemed to curve in and flare out again. Skirts became altogether fuller in 1905-7. The waistline began to rise, either all the way round to give a corselet skirt, or only at the back. At first the raised waistline was combined with a very full hem, but gradually the bottom narrowed and a columnar, empire period silhouette was achieved by 1910. These very narrow skirts restricted walking and were often called hobble skirts. The silhouette of the skirt greatly depended upon the fabrics from which it was made and the petticoats over which it was worn. The crisp silk taffetas and stiff wools of 1890s dress had given way to much softer, more fluid silks and suitings. The cut of the outermost petticoat reflected the curvaceous cut of the skirt. It did not need to be firmly interlined and perhaps lost some of its fascinating frou-frou rustle, though it continued to beguile in other ways, with its sumptuous hem frills that showed whenever the trained skirt was lifted. The softer fabrics suited paler colours than had been favoured in the brash 1890s, and a variety of delicate shades abounded with evocative names such as “eau de Nile” and “ashes of roses”. But it is a mistake to think that bright colours were never worn. Some extraordinarily vibrant and yet very attractive examples of early Edwardian dresses survive today, in rich jewel colours. 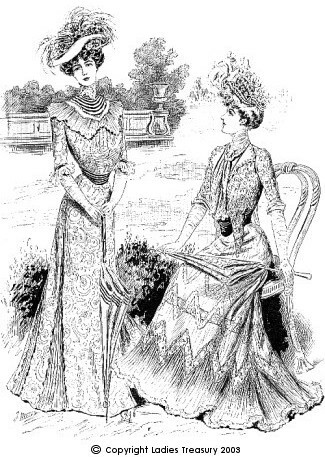 Soft clinging fabrics, wilting sleeves dripping with expensive lace and a flounced, trained skirt that had to be carried artfully with a skirt grip, all added to the air of elegant, luxury that accompanied the Edwardian lady and the leisured, perpetual summer afternoon which she seemed to inhabit. But the weather is never that obliging and winter clothes had to be worn. The tailor-made costume with its formal bodice and demi-trained or walking length skirt were decidedly more practical than the whimsical drapery of afternoon and evening dress. The most fashionable formal daywear favoured by the haut ton, during the early Edwardian era, was still the tailored dress. It consisted of boned bodice and skirt, sometimes with the addition of a matching jacket or coat. The bodice could be replaced by a jacket-bodice or longer coat-bodice, neither of which was meant to be removed. English tailor-mades were still at the forefront of fashion, but Paris remained the main source of fashion innovation. The Belle Epoque was a time when design houses burgeoned in Paris and even in London and New York. Along with the old favourites of Worth and Redfern who still held their own, other names came to the forefront, including Paquin, Doucet, Pingat, Felix, Poiret and Lucile. More practical still than the tailored costume, was the suit, consisting of jacket, matching skirt and contrasting blouse. This ensemble had arisen in the 1890s as the most useful style of clothing for the New Woman, the young, fashionable, sporting, working woman who was, herself, a late Victorian development. The New Woman may have been a Suffragette, advocating votes for women. She could also be one of the numerous and less controversial examples of ordinary, respectable, unmarried, sometimes well-educated, working women, who simply could not afford to stay at home, but who did not want to work as a servant or in a factory, as perhaps her mother may have done. The New Woman was essentially one of the expanding middle classes and not an upper class fashion leader. She therefore represented a much wider group of women. The “Gibson Girl” in the drawings of the American artist, Charles Dana Gibson, exemplifies the New Woman, at the moneyed end of the scale. Whether “New” or old, the Edwardian woman of the rising middle classes generally strove to imitate her “betters”. To her aid came the many ladies magazines which had arisen at the end of the previous century, in line with improvements in printing and in education. The result was a vast array of literature on fashion and grooming, sometimes excellent, sometimes quite tawdry, which aimed to show the aspiring reader how to dress like a courtier on a typist’s wage. Also helpful was the increasing availability of paper patterns for dressmaking, often included with the magazine. These showed elegant and complicated outfits best taken to a professional dressmaker for making up, as well as much simpler items which could be made at home. Most fashions were said to come from Paris, for Paris remained the source of all glamour. Keeping up the level of dress required to be called “respectable” was no mean feat even for the upper class woman. The number of changes of costumes in a day, the need for a good ladies maid to maintain them, hairstyles that were beyond the expertise of the ordinary woman, a new and very expensive hat for every costume, all stretched the budget of a lot of upper class girls striving to make good marriages. Many reasonably fashionable women of all classes complained about the effort and expense required in frequently shopping for items to refurbish old dresses, constantly keeping up appearances. No longer was it possible to make do with one or two new gowns a year. This was perhaps the downfall of this style of dress. It was simply too elitist. The future of fashion lay in the versatile suit, not in the elaborate, trailing, afternoon dress, no matter how beautiful. The suit was worn with a blouse. Arising from an informal garment, this had come into its own in the 1890s in conjunction with the suit, as a suitable alternative to the fitted day bodice. It has also been hybridised into the blouse-bodice with a boned lining and could even take the place of a dinner bodice. During the Edwardian era, the blouse was increasingly liberated from its lining, or was often made on a very lightly boned or even un-boned lining for convenience. It could be a practical shirt-blouse or a prettier formal blouse. It was also no longer required to be part of a suit or an informal at-home dress. An unlined blouse could, in fact, make up one half of a two-piece, semi-formal dress, perhaps another indication of the eventual move towards simplification in women’s dress. The Gibson Girl was a formidable exponent of the blouse. White was a very popular colour for summer dresses and blouses. These were made in gauzy white fabrics and often decorated with white embroidery and white lace. The fabric under the lace was cut away, sometimes revealing the wearer’s skin, e.g. on the arms and at the neck. This was considered quite provocative, and descriptions such as pneumonia blouse and lingerie dress were coined. White blouses and dresses, could be extremely expensive if hand-made and in theory were very impractical to wear. But they could also be bought ready-made, quite cheaply, though not necessarily well designed and sewn. They could also be made in cotton and linen which were both washable and even in affordable washing silks. White garments could also be sewn at home, adding to their practicality, and one skirt could be paired with a number of different blouses. As a result they were widely adopted and extremely popular, simple white blouses and dresses continuing to be worn in a modified form well after the complex, trained, white, formal dress had gone out of fashion by 1914. It is difficult to believe that the Edwardian lady was ever an active woman, but she enjoyed all of the sports that the New Woman of the 1890s had enjoyed, including, tennis, croquet, golf, fencing, riding and cycling. One new activity could be added - that of motoring. The motor car or automobile replaced the bicycle as the fashionable transport for the active woman, but it could only be really enjoyed by the rich. Like cycling, it developed its unique style of clothing, this time without ridicule. A long duster coat and a motoring hat with large veil were essential to travel in the open cars of the time. Other fashionable outerwear included jackets, coats and cloaks of every style and length. Fitted, semi-fitted, loose, short bolero, waist-length Eton, hip-length, three-quarter length and full length jackets and coats abounded and the long cloak and the short cape were never out of fashion. Knitted jerseys and cardigans were also worn informally and for sport. For evening, all kinds of mantles, capes and stoles in sumptuous brocades, laces, fur and feathers were available. Fur muffs, stoles and dress trimmings were popular for day wear too. The tea-gown was a fashion that belonged with the Edwardian era and sadly died with it. It exemplified the luxury and decadence that modern society claims it has rightfully left behind. Tea-gowns were originally informal, un-boned gowns, which allowed fashionable women to relax before dressing for dinner. They soon became a style in their own right and even a limited form of entertaining occurred at tea time, whilst wearing them. They were generally loose-fitting and elaborately trimmed, and gave full vent to the dressmaker’s or couturier’s skill and taste for theatricality. Tea-gowns were influenced by historical styles from eighteenth century watteau-pleats, to renaissance hanging sleeves and empire waistlines and quite often, all of them at the same time. Never has so much love and art been invested in such an arguably unnecessary garment. All kinds of informal garments including tea jackets, peignoirs, dressing gowns, combing sacques, morning robes and dressing jackets also had their place in the leisured Edwardian lady’s wardrobe, all of them beautifully decorated and almost all of them now obsolete. The empire or directoire style that fashion had tried to introduce in the 1880s and ’90s under the influence of the Aesthetic movement, finally took hold after 1906, resulting in a rising waistline and narrowing skirt. The French designer Paul Poiret claimed it entirely as his own innovation but the style had been hovering on the edge of mainstream fashion for a while. The new narrow silhouette was established by 1908 and could be represented by very simple styles and as well as complex designer-lead innovations. The new style required a new corset, this time finally dispensing with the waist-training that had plagued fashionable women for centuries. The new corset was long and straight and cut even lower on the bust, requiring the use of a bust-bodice to provide necessary support. It constricted the hips, did not squeeze in the waist and was so long that sitting down was a problem. The curvaceous womanly figure of the Edwardian lady had given way to a slimmer, more upright, more youthful but equally uncomfortable alternative. Hair and hats, an important feature in the belle epoque, were another source of discomfort. Hair in the 1890s began relatively simply but waves and puffs increased throughout the decade, in a style generally called Pompadour, recalling the fashion of that eighteenth century lady. Even more important than the hair of the '90s had been the hat, an increasingly elaborate affair that could be an inconvenience at the theatre or in church. By 1900 the puffed and waved hair tended to be tilted forward over the forehead. The large hat, often with upturned brim sat forward on the coiffure, emphasising the extraordinary forward tilt of the early 1900s woman. While the S-curve remained fashionable, the hair and hat remained forward. As the curve of the figure straightened, the coiffure began to fill out behind and at the sides until by 1908 it seemed to be sagging behind, under its own weight. The large, waved, back-weighted hair of the end of the decade supported perhaps the largest, wide-brimmed hats seen since the age of Gainsborough. The hat was ruthlessly speared to the coiffure with foot-long hatpins that endangered the eye of anyone who stood too near. All of this balanced precariously above a svelte column of a dress, which hampered the stride of its wearer by its narrow, hobble skirt. Such was the woman of 1909 to 1910, the epitome of elegance and luxury and once again, somewhat helpless. But beneath the surface of this impossible look was the skeleton of a much simpler form of dress. The corset no longer hampered breathing though it was long; the skirt though tight, could be cut with a vent or pleat to make walking easier; the bodice could be a blouse of the simplest all-in-one, magyar cut and though the weighty headdress was an insurmountable problem, in every other respect, dress in 1910 was beginning to reflect the practical needs of the twentieth century woman.